Sailing, snuba and snorkel with dolphins in Hawaii. 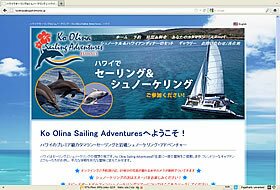 Sailing tour company in Hawaii promoting dolphin snorkeling tours as well as whale watching, turtle snorkeling and more. This is our second website with Website Design Japan. The service was excellent, great email communication, quick service and a well done website, Jeremy was awesome. If you want to do a website in Japanese, this is the company to go with.